Those who were offended by The Producers (and there were many) didn’t shy away from saying so. A few months after the film’s release, writer/director Mel Brooks was on an elevator in New York City when a woman noticed him and said, “I have to tell you, Mr. Brooks, that your movie is vulgar.” “Lady,” he replied, “it rose below vulgarity.” Indeed it did. Utterly fearless, this classic comedy joked about every taboo subject the late 1960s had to offer—including LSD, transvestitism, and of course, Adolf Hitler. 1. IT WAS INSPIRED BY SOME ACTUAL BROADWAY PRODUCERS. 2. ONE STUDIO WANTED TO REPLACE HITLER WITH MUSSOLINI. Brooks originally titled the screenplay Springtime for Hitler, after the fictitious musical that drives the plot. Given the premise, it’s hardly surprising that a horde of studios passed on the script. Universal expressed some interest, but there was a catch: While meeting with Brooks, legendary studio head Lew Wasserman told him, “Instead of Hitler, make it Mussolini. Springtime for Mussolini. Mussolini’s nicer.” “Lew, I’m afraid you just don’t get it,” Brooks replied. In the end, the project was picked up by Joseph E. Levine of Embassy Pictures. “You want Hitler, you got Hitler,” he told Brooks. “Just don’t call it Springtime for Hitler.” So the film was rechristened The Producers. 3. ZERO MOSTEL’S WIFE CONVINCED HIM TO JOIN THE CAST. 4. 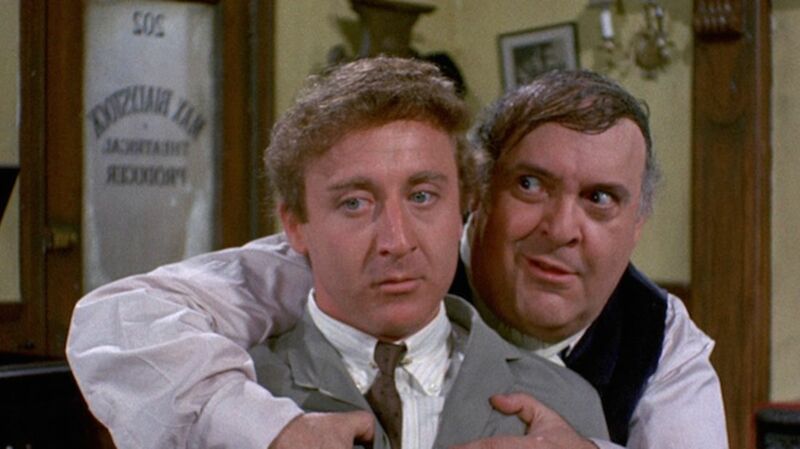 MOSTEL EASED GENE WILDER’S NERVOUSNESS WITH A GIANT KISS. Bialystock’s partner in crime is Leo Bloom, an accountant with some major self-esteem issues. Brooks wanted Wilder—whom he’d once described as a “perfect victim”—for the part. However, he didn’t dare hire him without first getting Mostel’s approval. And before that could happen, the two actors had to meet in person. 5. THERE’S A FRANZ KAFKA REFERENCE. It comes when we find Max and Leo busily looking for the worst play ever written. As they comb through a mountain of scripts, Max picks one up and reads the first sentence aloud. “Gregor Samsa awoke one morning to discover that he had been transformed into a giant cockroach,” he recites. After a split-second pause, he adds “It’s too good.” It actually is—that’s more or less the opening line of Franz Kafka’s The Metamorphosis. The original quote was “As Gregor Samsa awoke one morning from uneasy dreams, he found himself transformed in his bed into a gigantic insect.” Close enough. 6. KENNETH MARS SLEPT IN HIS COSTUME. To help the other actors feel genuinely uncomfortable around his character, Kenneth Mars—who played Franz Liebkind, Springtime for Hitler’s bumbling, former Nazi playwright—he’d take his costume home and sleep in it every night—without laundering a single garment. “I did not smell like a rose,” Mars admitted. 7. WILDER’S DOG HELPED ENHANCE HIS PERFORMANCE. 9. YOU CAN HEAR BROOKS’S VOICE IN THE “SPRINGTIME FOR HITLER” NUMBER. 10. PETER SELLERS HELPED PROMOTE IT. Before Wilder was cast, Brooks offered Peter Sellers the role of Leo Bloom. For reasons unknown, he didn’t take the job (some say that he was too busy shopping at Bloomingdale’s to really listen to the pitch), but he was clearly a fan of the film. While filming I Love You, Alice B. Toklas! in Los Angeles, Sellers gathered some friends and set up a weekly film club. One week, when their plans to watch Federico Fellini’s I Vitelloni fell through, they put on The Producers. Sellers loved every frame of it. Once the picture ended, he called Levine to congratulate him—at 2 a.m. Much to the actor’s dismay, he was informed that The Producers was in dire straits. After a disastrous test screening in Philadelphia, Embassy Pictures planned on shelving it. Luckily, Sellers convinced the studio to give it a broad release. Then he helped promote the movie further via full-page ads that he personally took out in Variety and The New York Times. 11. IT BEAT OUT SOME ELITE COMPETITION AT THE OSCARS. Thanks in no small part to Sellers’s endorsement, The Producers became a respectable hit. Strong word of mouth about the film spread like wildfire and, in 1969, it was nominated for two Oscars: Best Supporting Actor for Wilder, and Best Original Screenplay for Brooks. Brooks’ competition in the latter category was fierce, and included Stanley Kubrick’s 2001: A Space Odyssey, one of the greatest science fiction movies of all time. Yet, groundbreaking as Kubrick’s picture was, The Producers took home the gold. 12. BROOKS PERSONALLY REPLIED TO EVERY JEWISH LEADER WHO CONTACTED HIM WITH A COMPLAINT ABOUT THE FILM. Brooks has said that one of his “lifelong jobs” is “to make the world laugh at Adolf Hitler.” For Brooks, The Producers was a way to enact vengeance through comedy. “The only real way I could get even with Hitler and company was to bring them down with laughter,” Brooks said. But some viewers felt that the film actually promoted Hitler. When The New York Times critic Renata Adler saw The Producers during its original run, she accused the movie of setting up an awful precedent. “I suppose we will have cancer, Hiroshima, and malformity musicals next,” Adler wrote in her review.